Govt. 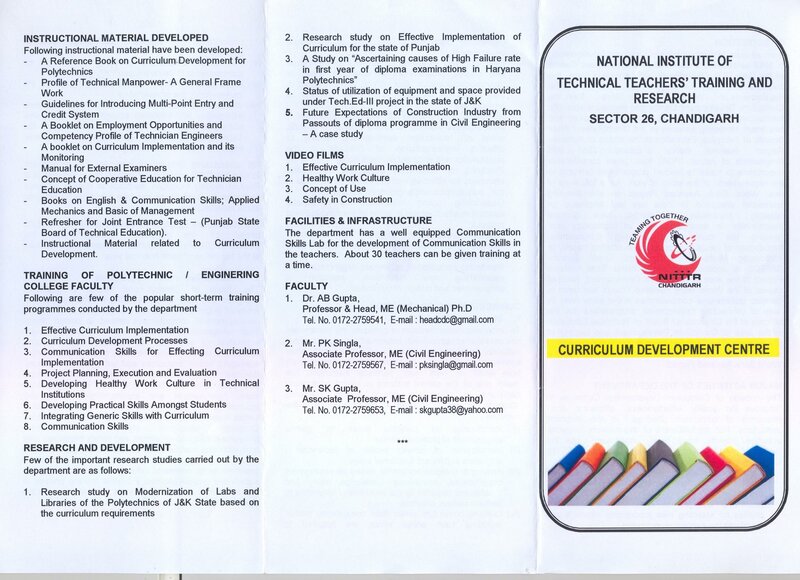 of India, Ministry of Human Resource Development, in 1971 established a Curriculum Development Centre at NITTTR, Chandigarh with a view to keep the curricula offered by the polytechnic in tune with the requirements of World of Work. Since then, Curriculum Develoment Centre has evolved a scientific methodology of designing / revising the curriculum and has been rendering services to the Directorates / Boards of Technical Education in the states of Northern Region. National Policy of Education-1986 and Programme of Action (POA) has given considerable importance to make technician programmes relevant to the requirements of the world of work. As a follow up of this, World Bank Assisted Project on strengthening Technician Education in India has laid emphases on capacity expansion by starting new diploma programmes in emerging areas of technology and revising the curricula of existing programmes. Introduction of flexibility in programme offering by way of introducing Multipoint Entry and Credit System (MPECS) is another initiative of World Bank Assisted Project in the area of Curriculum Development. Another aspect of the World Bank Assisted Project has been to develop professional competencies at the state level by way of conducting orientation and development programmes for the official of the Directorate / Board of Technical Education) in the field of Curriculum Development. Keeping in view the above, the mission of Curriculum Development Centre has been to "Improve the quality, effectiveness, efficiency and relevance of curriculum offering in the polytechnics." For the fulfillment of this mission, following activities/ projects have been undertaken since the inception of Curriculum Development Centre at NITTTR, Chandigarh. Rendering consultancy to various organizations for establishing new institutions, selection of programmes and design of curriculum. To undertake design/revision of curricula, the institute has established rapport with industrial/ field organizations; industrial associations like CII, PHDCCI and other academic institutions. Involvement of professionals from world of work and technical institutions (including the faculty of polytechnics) has been one of the salient features in taking appropriate decisions in curriculum design/ review. Following strategy is being adopted in designing/revising the curricula. Arriving at competency profile, based on employment opportunities, comprising knowledge, skills and attitudes required by the technician engineers to perform various activities. Working out resources required (physical, human, information and financial) according to norms and standards laid down by the All India Council for Technical Education (AICTE) for effective implementation of curricula. For undertaking revision of curricula, the institute follows the CIPP model (i.e. Context, Input, Process and Product model) to obtain feedback in respect of each component, identifying gaps and take decisions for bringing about modification. 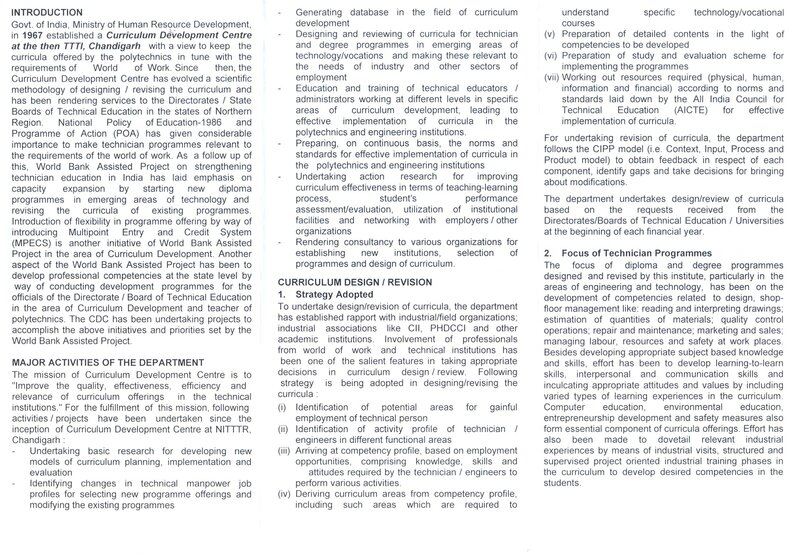 The institute undertakes design/review of curricula for technical programmes based on the requests received from the Directorates/Boards of Technical Education. The curricula designed/revised by the institute are industry oriented and need based. The department also undertakes design and revision of curricula for physically challenged persons. The focus of diploma programmes designed by this institute, particularly in the areas of engineering and technology, has been on the development of competencies related to shop-floor management like: reading and interpreting drawings; estimation of quantities of materials; quality control operations; repair and maintenance; marketing and sales; managing labour, resources and safety at work places. Besides developing appropriate subject based knowledge and skills, effort has been to develop learning-to-learn skills, interpersonal and communication skills and inculcating appropriate attitudes and values by including varied types of learning experiences in the curriculum. Computer education environmental education; entrepreneurship development and safety and measures also forms essential component of curricula offerings. Effort has also been made to dovetail relevant industrial experiences (by means of industrial visits, structured and supervised industrial training and project work) in the curriculum to develop desired competencies in the students. For undertaking design/revision of curricula, financial assistance is provided by the Directorates/Boards of Technical Education. Efforts have also been made to involve leading industrial houses to contribute financially for undertaking curriculum design/review projects in specialized areas of technology. This type of financial assistance will be further strengthened in the years to come. As a philosophy of the institute, efforts have been made to dovetail relevant industrial experiences as part of every curriculum in the form of industrial visits,structured and supervised industrial training and project work. Efforts have been made to include components of environmental education and entrepreneurship development by introducing awareness camps in the curriculum of every diploma programme. A subject has been included in all the diploma programmes. In addition a personality Devlopment Camp has been introduced in the 5th semester of each diploma programme. Besides promoting the concept of Multi-Point Entry and Credit System (MPECS) in the states of Northern Region, electives are provided to take care of emerging areas of technologies in some of curriculum documents. The institute provides extension services for helping the polytechnics in procurement of equipment and setting up laboratories and workshops as per requests received from the Directorates of Technical Education and Polytechnics of various states. The institute offers need-based short term training programmes for upgrading knowledge and skills of polytechnic teachers. The institute prepares instructional material in the areas of curriculum design,curriculum implementation and curriculum evaluation. State Directorates of Technical Education and Polytechnics in the Northern Region are also provided guidance from time to time to identify and remove the bottlenecks. The department has a well equipped Comunicaiton Skills Lab for the development of Communication Skills in the teachers. About 30 teachers can be given training at a time. State of the art infrastructure for developing Listening, Speaking, Reading and Writing Skills in the teachers and students. Software: Language Lab software, Study Skills Success and Sky Pronunciation are available. Facilities such as power-point projector, white boards, video camera and telephone etc. are available to conduct the practical exercises and providing feedback to the trainees. Concept of cooperative education for technician education.